Sometimes just one. Sometimes a few. 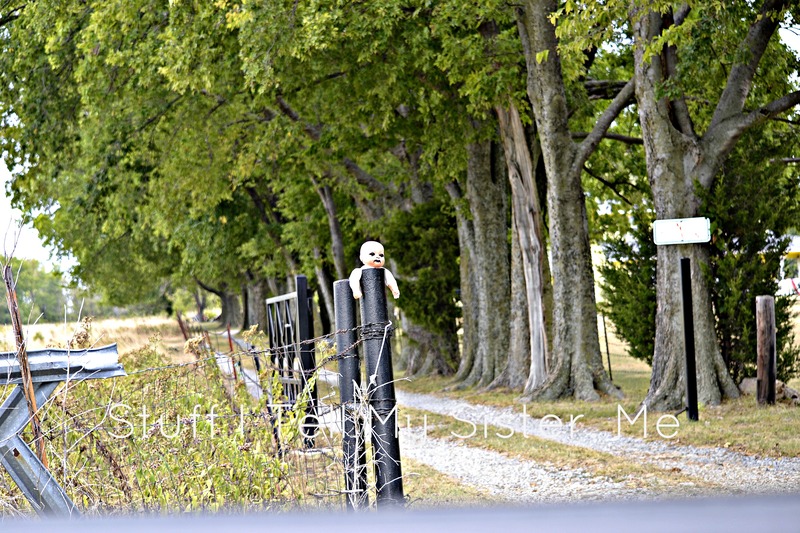 On the fence post of a beautiful home in the country. We are intrigued and curious. Should we be concerned? Or are they just messing with us? 🙂 If this is a universal code for something and I’m in the dark? …..please enlighten me! 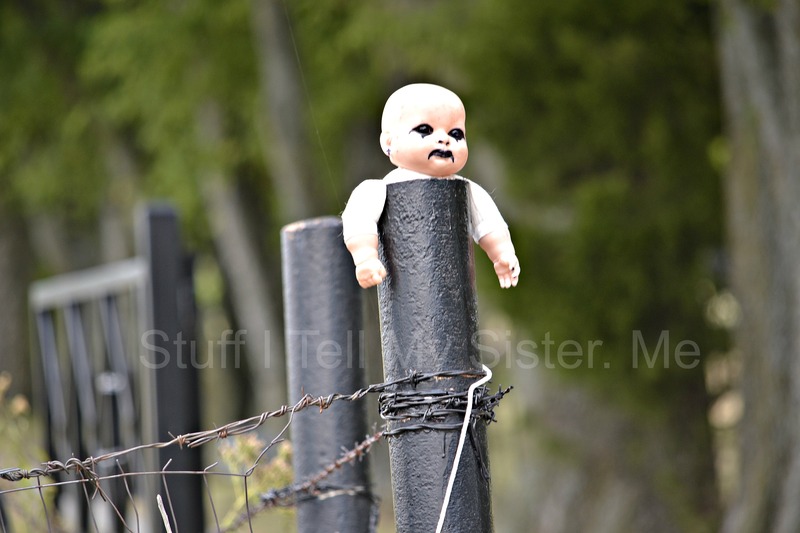 This entry was posted in art, Curiosity, Intrigued, Uncategorized and tagged Art, cause for concern?, concern, country home, curiosity, dark humor, depression, doll, fence post, morbid, neighbors doll collection, sadness, scary, weird, weird doll. Bookmark the permalink. We need Trixie Beldon and Nancy Drew on this case! Now that is perfect and so true! I want to read this column, for sure! I have pictures as well and I have always wondered what the deal was? I have also seen several babies up in the tree, legs stapled to tree hanging down towards road. It definitely gives you the chills. That it does. I was going to go to the door and ask, but since there are “no trespassing signs” posted, hubby says I shouldn’t do that…..inquiring minds! This is really gruesome, and in very bad taste. What a bizarre mystery. You need to mention it to the local authorities. COULD be pre-Halloween decorations, but let the authorities be the judge, and then YOUR conscience will be clear IF something comes from it. Everyone that lives in the country are NOT just in search of peace and quiet. I’ve seen it year around, new dolls destroyed with paint. When these heads are gone they add more. That is the strange thing, Sandy. This is our 4th season here, and it is off and on year round. Not just for halloween. And sadly, you are right about the country thing…. Yeah, just give the sherrif a heads by, then if it turns out to be a Jonestown, YOU can sleep better than if you’d done nothing. Seems REALLY weird, that responsible adults would BOTHER to deface their property in THIS fashion! A little SICK! I, too, would clue the authorities in….just for peace of mind. It really makes me wonder…. and perhaps that is why it is there??? That is so creepy! Do you think it is a tasteless observation of Halloween? Halloween? Abortion Awareness? Some creepy cult? Looks like some sick person might have done this. I would be careful! Maybe they have a (rebellious) teenager who belongs to one of those Goth groups. You know they wear all black, and dye their hair black, and wear black lipstick/eye makeup. Or maybe the “Adams Family” secretly lives there. It really isn’t anything to joke about. I guess since it’s on private property they can put anything they want on their fence posts. There’s an oddball in most every neighborhood. Maybe they are waiting for someone to give them a handshake and a plate of cookies. Please tell us what you find out. SCARY! Found one similar several years ago out kayaking – so odd. Yeah – out on Table Rock on a sand bar. Not in very good shape. I’ve never seen this anywhere and hope I never do!!! Very creepy and I sure don’t like it! Please keep us in the loop if you find out anything!! Eek! It’s kind of creepy in a Chuckie doll sort of way! haha…oh great…now guess what I’ll dream about tonite! lol! Eeek. the only word that fits! yep….that’s a good word for it! crazy, huh! we drove by yesterday…it’s still there! Something to pin on Pinterest????? I agree …..teach them “life stuff” that they will LOVE. Nature and music…..you just cannot go wrong with either! Was this ever resolved? Reported to authorities? With the recent CO tragedy, I’m spooked by EVERYTHING! I think the doll needs a hat and sunglasses the next time it shows up. Then it won’t look as creepy. And you will be messing with them as much as they are messing with you. Thank you for stopping and giving me a like on my blog. I very much appreciate it. I have nominated you for the Ligo Circle of Appreciation You can pick it up at my blog http://mhdriver.wordpress.com the instructions are at the top of my blog.